There’s nothing extreme or outlandish on my list of things I missed from back home while traveling. I realized it’s more about the little things you crave — the norms of your everyday life — that seem to be worth coming home to. Every now and then I need to recharge. After 70 days of bunk beds, communal dining, and meeting new people every day, sometimes you just need to get away. But when getting away means walking around, or going to dinner by yourself, you’re still surrounded by people. I missed those lazy afternoons with a book, a couch, and my own thoughts to keep me company. No, I don’t mean Tex-Mex, Taco Bell, generic Mexican food, although I am always down for a cheesy gordita crunch. I mean authentic, spicy, flavor-beyond-anything-you-could-ever-imagine Mexican food. Though I’ve tried every Mexican restaurant I’ve come across abroad, I’ve yet to leave satisfied. After one case of food poisoning and countless sorry excuses for a burrito, I’ve learned to just wait until I get back home. After all the flipping off, road rage, and mind-numbing traffic, you would never think that you would miss driving. But when it gets to the point where it takes you an hour to get across the city on a metro, you’ll miss your car more than anything. There is something about having a car and knowing you are free to go wherever you want that becomes something to truly miss. I once paid 5 euro for a so-so salmon roll in Spain, and let me tell you, you have to be pretty damn desperate to settle for low-grade raw fish. Don’t get me wrong, there is plenty of sushi abroad, but nothing of quality that I can even attempt to afford. Coming from California where all-you-can-eat sushi buffets and delicious supermarket rolls are a staple, I definitely missed this Japanese delicacy. 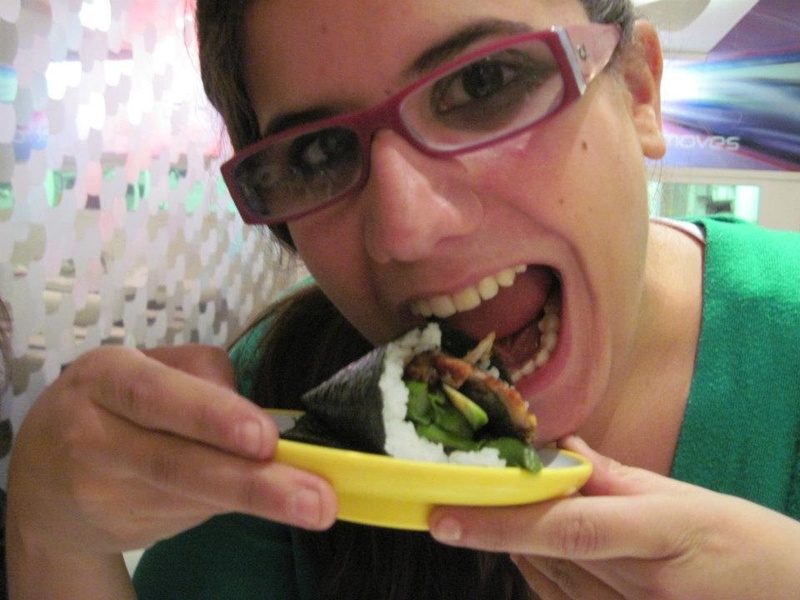 Kriss enjoying our 5 euro sushi, como se dice ‘ridiculous’? Ugh. Carbonated water. My personal kryptonite. You can’t imagine the anguish experienced on a hot day, traipsing through the city, dying of thirst when you open a bottle to that sound. The “pssssst” of the bottle cap was like a dagger to my heart. When the label is in a different language you have no idea what you’ve picked up until after you leave the store. After being back home and opening a refreshing, flat water bottle that doesn’t taste like fart, I definitely don’t miss the mystery. This entry was posted in Blog, Just for Fun and tagged alone, car, Featured Content, globetramp, homesick, mexican food, Solo travel, sushi, things I miss, travel. Bookmark the permalink. Hey Miss GT or may I call you Miss G & T? Loved it as I too have a long list but I wonder when we’re home what we will miss from our travels? oh, I like Miss GT! hahaha, there are way too many things to miss from our travels, there wouldn’t be enough space on WordPress to write them all down. What did you miss from home? Those all sound good to me! It’s always about the food! I feel a bit redeemed that I’m not the only one who misses food more than just about anything else. That and my parents’ pets. Does that make me a bad son/brother/friend? The dogs and burritos can’t email. And the ocean of course. And redwood trees. Okay, I have to stop before I post my next blog as a comment. Yeah…I could see the Mexican food one, I really could. book. Water that smells like a fart? LOL,LOL,LOL,LOL only because there is truth in it!! Thank you! It really means a lot! You are ridiculous, in the best way possible. Keep them coming Hay, this is one of my absolute fave things to read! I am heading home soon and I missed some of these same things. Here we come reverse culture shock!